I really enjoy filming videos to share my painting processes with you, and I also hate it. So often I got to film a painting demo, and halfway through I think, "This is terrible!" Nothing seems to be coming together, I'm not sharing any information of interest, and I'm bored by my own painting demo. So that explains why I don't post videos as often as I would like. It's just like the rest of painting; a lot of hard work goes into painting duds that no one will ever see before a good painting actually happens. 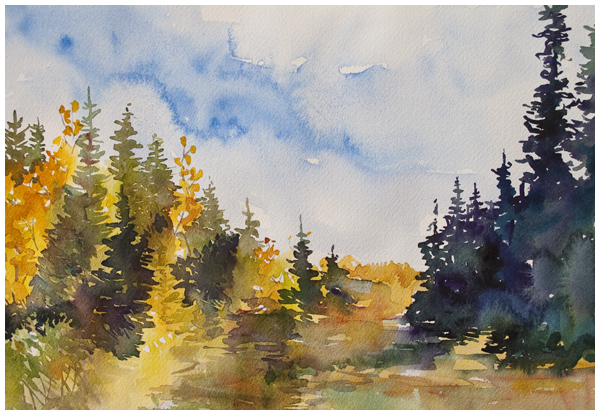 In my newest painting video, I work through a watercolour landscape, start to finish. It's a simple landscape, but it's a great exercise in painting skies, making composition decisions and pulling a landscape together. There are many elements in landscape painting that must all come together for it to work out, and I still feel like I'm learning. I've titled the finished painting "Muskeg Corner" and it is available for purchase on my original paintings for sale page. Thanks for watching!